New Yorkers will soon be able to go to a concert on a floating park, thanks to a billionaire media mogul and his wife. The $130 million project is being funded by Barry Diller, who runs the entertainment company IAC/InterActiveCorp, along with his wife, the celebrity fashion designer Diane von Furstenberg. It is the largest donation to a public park in New York City's history. 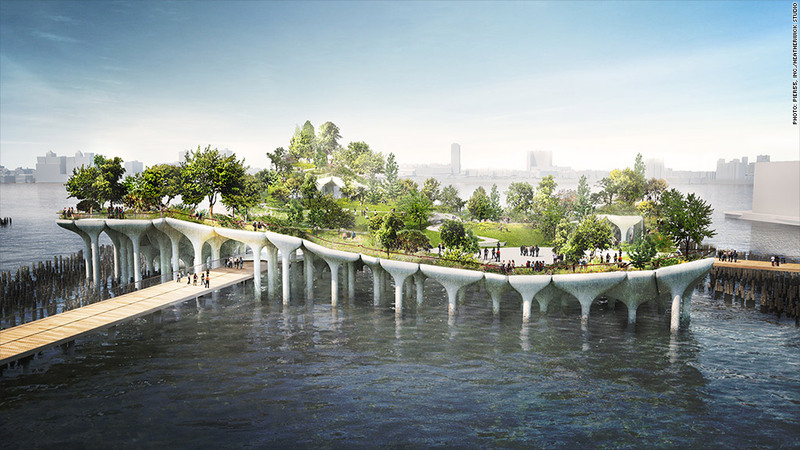 The 2.7-acre park will be built on stilts above the water in the Hudson River along Manhattan's west side and will replace a disused pier. It will feature rolling hills and winding footpaths that meander between open spaces that have grass and trees. Diller and city officials, who unveiled the plans Monday, say construction will begin in 2016. 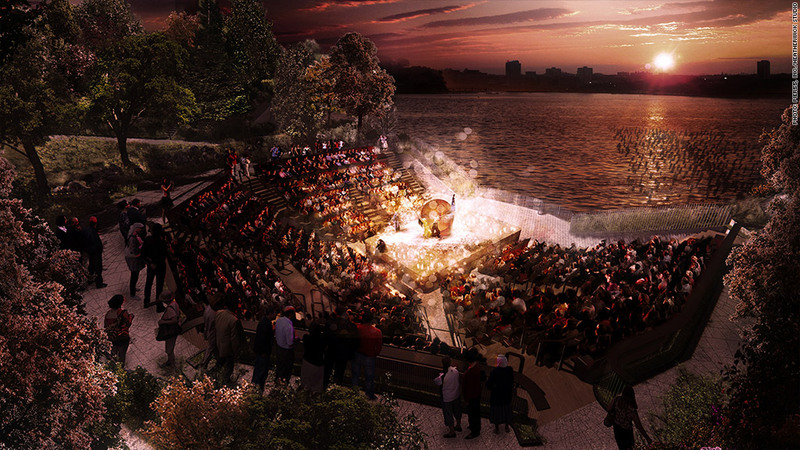 The project, known as Pier55, will feature a mix of green spaces and performance venues. It's billed as a place where people can take in a concert or a play, or simply have lunch or lay in the grass. 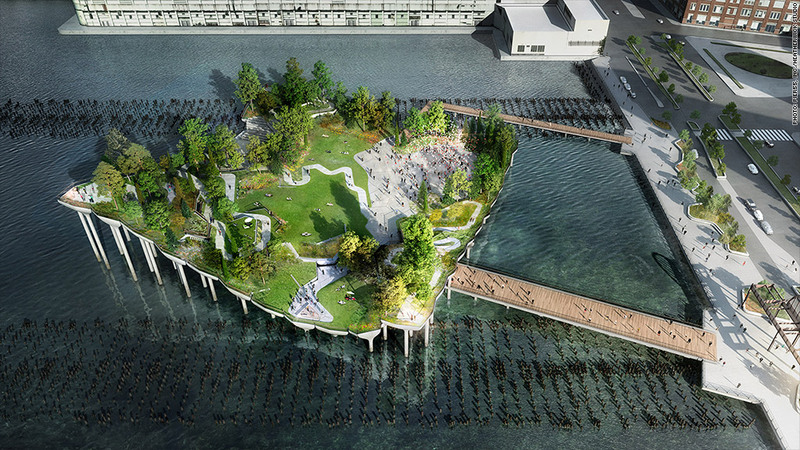 Pier55 is being built with the Hudson River Park Trust and will receive support from New York City and New York State, but is primarily being funded by the Diller-von Furstenberg family. "New York has always reminded me of Venice, so I am happy the time has come to properly honor its waterways," said Diane von Furstenberg. "What better than a park on the city's western bank to rest, watch a sunset or a performance?" The programing and other activities at the park will be overseen by a non-profit group called P55, which also has the family's backing. It's part of an effort to revitalize Manhattan's once-industrial waterfront by converting old infrastructure into public parks. The High Line, a 1.5 mile walkway built on an abandoned elevated train track, has become a major destination for city dwellers and tourists alike. "The revitalization and transformation of this pier into a vibrant arts and community space will bring new energy and new visitors to our waterfront," said New York City mayor Bill de Blasio.